In just over three short years, the pioneering Brooklyn Bhangra funk & dhol n’ brass band Red Baraat have made a name for themselves as one of the best live bands playing anywhere in the world. As an up-and-coming jazz drummer with numerous awards and commissions over the past decade, their leader Sunny Jain has had plenty of chances to swing behind the drum set. 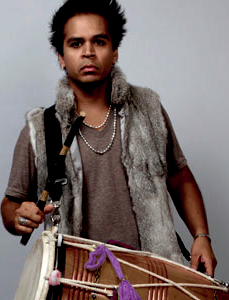 But it’s in his role as a dholi, or dhol player (double-sided barrel shaped North Indian drum slung over one shoulder), that Jain swings the hardest, leading Red Baraat, the unique and highly funky hybrid of a marching band that he founded four years ago in Brooklyn. The nine piece comprised of dhol drum-set, percussion, sousaphone, and five horns melds the infectious North Indian rhythm Bhangra with a host of sounds, namely funk, go-go, Latino, and jazz. Simply put, Sunny Jain and Red Baraat have created and defined a sound entirely their own. Red Baraat performed their own TED Talk at the flagship TED Conference in 2012, in front of a dancing audience of thought leaders including Al Gore, Matt Groening, and David Byrne. They accepted an invitation to the White House, where an assembly of elected and business leaders expecting a string quartet were treated to a full throttle bhangra thrown-down. They were brought clandestinely to Google’s Mountain View Campus by a fan on the inside – and second-lined the joint―with Google employees streaming in from all directions as the event went from zero to viral within two songs. And were handpicked to close the London 2012 Paralympic Games in the center of Trafalgar Square. Baraat is Hindi for a marriage procession. In North India, it is a tradition on the day of the wedding for the groom to travel to his bride’s home on a magnificently decorated horse, accompanied by family and friends. Led by a dholi and/or a marching band, the live music is inseparable from the joyous celebration and naturally induces dancing and singing. Since their inception in October 2008, Red Baraat has delivered blistering performances at globalFEST, Montreal Jazz Festival, Sunfest, Chicago World Music Festival, Lincoln Center, The Kennedy Center, Madison World Music Festival, New Orleans Jazz Festival, Pori Jazz Festival (Finland), Molde Jazz Festival (Norway) and Chicago Folks & Roots Festival, among many others. 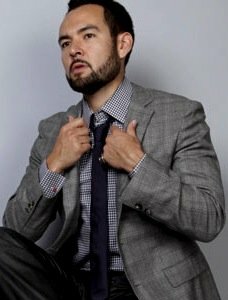 They also recorded the credit roll theme song for the movie, „The Yes Men Fix the World“ and performed for the 2009 Mercedes-Benz Fashion Week (NYC) for Ports 1961 runway models. Red Baraat has been featured in National Geographic, Wall Street Journal, The New Yorker, Relix and Songlines, among many others. 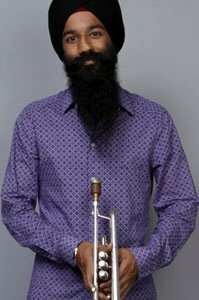 He is an innovative dhol player, drummer and composer who was voted a Rising Star percussionist in the 2011 Downbeat magazine critics poll. 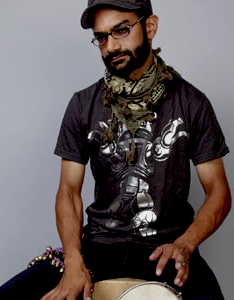 His musical journey led him to founding Red Baraat in September 2008, culling together his experiences seeing Indian marching bands in the streets of Delhi, India and the kaleidoscope of sounds striking him in New York City. – Born to Punjabi immigrant parents and raised in Rochester, New York, Sunny grew up with the sounds of India (Bollywood, Bhajans and Hindustani), as well as Western rock (Led Zeppelin, Genesis, Rush, etc.). Falling in love with the sounds of jazz at age 12, Sunny immersed himself in the study of the language and its masters. Sunny’s jazz releases (Taboo, Avaaz, Mango Festival, As Is) have all received critical acclaim. Sunny also plays drumset and dhol for the sufi-rock group Junoon, for whom he recorded “Open Your Eyes,” featuring Peter Gabriel. The group performed at the Nobel Peace Prize Concert in 2007, Kashmir, India in 2009 and United Nations Concert for Pakistan in 2010. In addition, he is the snare drummer for Bang on a Can’s 12-piece ensemble, Asphalt Orchestra, who recently recorded a song with David Byrne and St. Vincent. He has received commissions from the Aaron Copland Music Fund and Chamber Music America and was a recipient of the Arts International Award in both 2005 and 2003. He played dhol in the first ever Indian Broadway show, Bombay Dreams (2004) and made his Hollywood debut playing dhol in the movie, Accidental Husband, starring Uma Thurman, Colin Firth, and Isabella Rossellini. In 2002, Sunny toured West Africa as a Jazz Ambassador designated by the U.S. Department of State and The Kennedy Center. Sunny is the author of 2 instructional drum books. For more information please visit: www.sunnyjain.com. 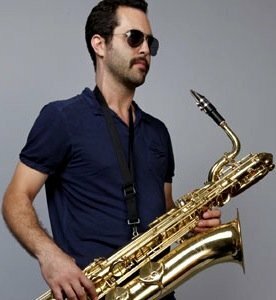 Born and raised in upstate New York, Michael Bomwell has been playing saxophone since the age of 11. He came up through the New York public school music system, learning from some of the best teachers in the country, not the least of which was his own father. He went on to study applied saxophone and jazz studies at the University of Michigan, where he met many of his future colleagues. Since arriving in New York City in the Fall of 2001, he was performing with David Liebman, Clarence Clemons, Sandy Duncan, Charli Persip, Edison Woods, Olivia Newton-John, Ken Peplowski, Amy Lynn and the Gunshow, Henry Haid, the Motor City Horns, and the Euphonique Saxophone Quartet. Michael has appeared on recordings with Red Baraat, Amy Lynn & the Gunshow, Edison Woods, the Scott Gwinnell Jazz Orchestra, Bird of Paradise Orchestra, and the University of Michigan Jazz Ensemble, as well as the contemporary chamber group, Phoenix Ensemble. 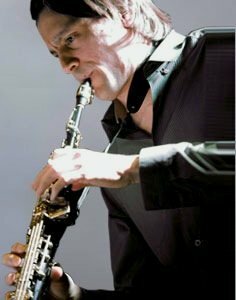 In addition to being a saxophone, flute, and clarinet player, Michael teaches instrumental music, jazz and contemporary music history, and studio recording at an independent day school in New York City. Alex was born and raised in Canandaigua, NY and began studying the saxophone at age 10. He earned a performance degree in Jazz and Classical Saxophone from the Eastman School of Music where he studied with Ramon Ricker. Performing in NYC and abroad throughout Japan, India, Russia, Europe and North America, he has shared the stage with SPOON, Duffy on, St. Vincent, Yo La Tengo, The Radio City Orchestra, Fela! Asphalt Orchestra, Red Baraat, The Spirit of Ray Charles, European tour of Grease, ICE, Fireworks Ensemble, Argento Ensemble, Alarm Will Sound, Euphonique Saxophone Quartet, Darcy James Argue’s Secret Society, and Antibalas. (MiWi The Wolf) is a graduate of the Eastman School of Music on Bass Trumpet and Trombone. He is also a singer/songwriter and performs regularly on Bass Guitar. 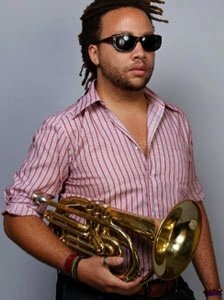 He has performed and/or recorded with Spoon, Charlie Hunter, Les McCann, The Impressions, Antibalas, Mike Gordon Band, Mocean Worker, Noah and the Whale, Fela! on Broadway and Lagos Nigeria, Bat for Lashes, Nublu Orchestra w/ Butch Morris, Elvis Perkins in Dearland, Knights on Earth, Thought, MMW, and the Brazilian Girls to name a few. At the age of 12, he dreamt of playing saxophone, but his mother, a single parent of two, could not afford an instrument. 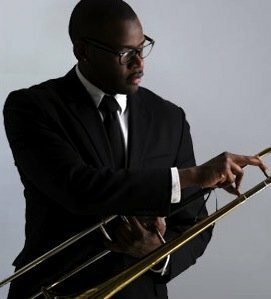 While in the 6th grade, Ernest signed up for beginner’s music classes and took an option to study trombone. Throughout high school he studied classical music with bass trombonist Jose Vidal in Sicklerville, NJ. Eventually the lessons and hard work paid off landing Ernest spots in top district orchestras and earning him numerous awards in local jazz competitions. After graduating from high school all roads seemed to lead towards Philadelphia, Temple University. While at Temple Ernest studied with Luis Bonilla for four years. During his undergraduate studies he began to make a name for himself around Philly as a very versatile trombonist playing various styles of music such as jazz, salsa, r&b, neo-soul, and hip-hop with such artist as The Roots, Captain Black Big Band, Jaguar Wright, Orrin Evans, John Swana, Jimmy Jorge and the Latin Express, Tim Warfield, Thee Phantom, The O’Jays and more. After graduating from Temple, Ernest set his sights on a new city: New York City. Since moving to New York, he has played in such clubs as the Village Vanguard, The Iridium, Smoke and the Blue Note, and has shared the stage with musicians such as The Duke Ellington Orchestra, The Village Vanguard Orchestra, Reggie Workman, Charles Tolliver, Terell Stafford, and Anthony Wonsey to name a few. For more information please visit: www.erneststuart.com. AAs tubist, composer, and conductor, John Altieri has amassed a considerable list of performances, recordings, and compositions to his credit. 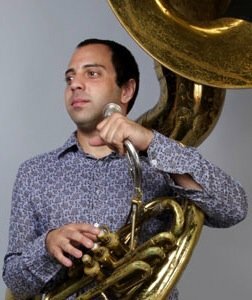 In addition to being the sousaphonist of Red Baraat, other recent work includes conducting Josh Sitron’s scores for Jonah Hill’s Fox tv show Allen Gregory, recording tuba for Korea’s vocal sensation Sweet Sorrow, orchestrating Carter Little’s score for The Living Wake starring Jessie Eisenberg, and composing new works for the California EAR Unit and Now Ensemble. For more information please visit: www.altierimusic.com.